Central Park Apartments - Right in Jindabyne Central park Apartments Jindabyne Central Park Apartments Entrance and stairs to 18 Central Park 18 open plan with balcony overlooking Jindabyne CBD Central Park 18 Right in Jindabyne Central Park 18 main bedroom with queen bed and superior linen Central Park 18 second bedroom with 2 x bunk beds. Top bunk only suited to childern Central Park 18 kitchen with lounge and doors to veranda Central Park 18 equipped kitchen with diswasher Central Park 18 Bathroom with laundry and separate WC Central Park Apartments Off Street Parking Hire a Bike and try the Thredbo MTB park Disc golf on Jindabyne lake foreshore Snow on the deck Perisher Golf at 1/2 hour away at Thredbo or Berridale Hire a canoe on Lake Jindabyne in summer Segway tours at Crackenback. Ask us Take the family for a bike ride around Lake Jindabyne. 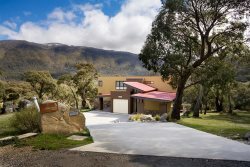 We can organise rental More golf action at Thredbo Come for ski in winter at Thredbo or Persiher Hiking with the family around the many trails round Jindabyne. Central Park 18 is a comfortable, fully contained, upper level, 2 bedroom apartment for up to 6 guests. The property is on the upper most floor [ 2nd floor -3 flights - no lift] and has a balcony with views over the CBD to the mountains and its central location is a great advantage. Walk across the road to Jindabyne’s many shops, cafes, restaurants and the conveniences of Woolworths supermarket.Just round the corner from your unit is Birchwood Cafe and across the street is Takayama Japanese Restaurant. These two establishments are at the top of the cafe and restaurant scene in the Snowy Mountains. Woolworths and Jindabyne retailers are all within a 2 minute stroll. The master bedroom has a queen bed and the second bedroom has two sets of bunks.We provide you with crisp white linen. The bathroom has a shower over a full bathtub with oversized soft bath sheets. The laundry features both washing machine (with powder) and dryer. The open plan living area comprises enjoy's a fully equipped kitchen with a dishwasher. For coffee lovers, there is a "Nespresso" capsule coffee machine (bring your own favourite blend). The ipod/iphone speaker tower will allow a chance to relax listening to your favourite music and the TV can be connected to your laptop via HDMI cable (supplied). Although there is no direct internet at the property. You can also order 22gb of Telstra 4G Mobile Broadband Wi Fi modem with your reservation. Our properties are fully self-contained with full kitchens and laundries. Luxurious Crisp White Linen & Oversized Bath Sheets are supplied along with tea, coffee, hot chocolate, toilet paper and detergents for your entire stay with us. NO STARTER PACKS. If you run out just call us! I would come back and rent Central Park 18 again. Ray White Jindabyne has good service. They waited until we arrived late to pick up keys and told us about the drive from Melbourne was long. Convenient location, placed in the heart of the township. Loved the welcome package with the local tips from Ray White. Great touch! The place was centrally located in Jindabyne with almost everything you'd need in walking distance. House was as described and he heaters worked a treat! Great place all round. Check in/out is very well organsised. Thank you Peter and family. Happy with our stay, thank you. Terrific place to stay. Look forward to coming back next year. Cheers! Very spacious, very comfortable and conveniently located. Exact creature comforts we needed after a long day on the slopes. We'll be back for sure! We thoroughly enjoyed our stay in Jindabyne and would recommend Apartment 18 to a family. The apartment met our needs well. I do not remember if the listing mentioned that there is no lift and the flat is on the top floor. This was not a problem for us but it could be for others and should be made clear. Ray White Jindabyne made our holiday easy with good friendship and directions. Thank you Peter for the detail explanation for check-in procedures. We had a wonderful time. The location is perfect for hiking to Charlotte Pass. The place clean and cozy, perfect for a group of friends! The location is fantastic, directly across the road from Woolworth, making grocery shopping so convenient. The cinema is a short walk away. The kitchen is well equipped with everything necessary and we really enjoyed the stay. The place is clean and we are pleasantly surprised to see that the hosts have left us a box of chocolate as Christmas welcome gift. It is like a home away from home. Property does have Contained Asbestos Contaminated Material [ACM].